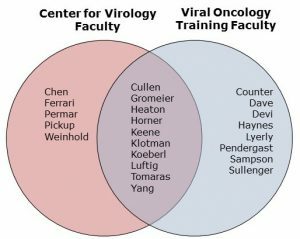 The purpose of the Viral Oncology Research Training Program is to provide training at the pre- and postdoctoral levels in the general field of molecular virology with an emphasis on the molecular biology of tumor viruses and oncogenes. Seventeen faculty members in various academic departments at Duke University Medical Center, working in the areas of molecular virology, viral and molecular oncology, and viral vector-based cancer vaccine therapeutics, constitute the program faculty. These faculty members train graduate students and postdoctoral fellows who are supported by a variety of mechanisms including institutional research training programs, research grants, and individual pre- and postdoctoral fellowships. In addition to research mentoring, the program serves to train the next generation of virologists and cancer biologists with various professional development opportunities throughout the year. These opportunities include a joint Duke-UNC Symposium on Viral Oncology and AIDS Malignancy in the fall and a Minisymposium on Pathogenic Human Viruses in the spring. Predoctoral trainees are expected to enroll in the Virology and Viral Oncology graduate course (MGM552) during the spring. A monthly journal club, which is organized by students and postdoctoral fellows, is offered throughout the year in addition to monthly happy hours and works-in-progress seminars offered in conjunction with the Duke Center for Virology. Finally, an annual grant/fellowship writing workshop is offered each year by the Duke University Office of Research Support . Each post-doctoral trainee who enters the Viral Oncology research training program will receive an NIH-level stipend commensurate with his or her years of post-doctoral experience, health insurance for the trainee and his or her family, annual travel funds to attend scientific meetings, and a small supply budget. Predoctoral trainees will be supported during the second year of graduate school if they have selected a mentor who is a member of the training faculty and are selected by the executive committee of the training program. These students will also be eligible to apply for travel stipends during the training period and will receive a small supply budget. If you are interested in participating in the Viral Oncology Research Training Program, please review the current list of training program faculty. Program participants must be affiliated with a training program faculty member’s lab. For questions or additional information please contact Micah Luftig, Associate Director of the Viral Oncology Training Program. Trainees in this program have achieved myriad accomplishments. Follow this link for a summary of past and current trainees listed by mentor spanning the last ten years. The Duke Viral Oncology Training Program is committed to providing reasonable accommodations for qualified individuals with disabilities in compliance with Section 504 of the Federal Rehabilitation Act of 1973, the Americans with Disabilities Act (ADA) of 1990 and the ADA Amendments Act of 2008, as well as applicable state regulations and federal and state privacy laws. If you believe you may need and qualify for reasonable accommodations, please visit Duke’s Disability Management System at http://www.access.duke.edu for detailed information and procedures.